The invention of email communications has had a profound impact on businesses in the past two decades. Decisions can be communicated rapidly, information can be dispersed to wide audiences with ease, and data can be transferred between parties with limited effort. It is truly a revolution in the way we do business. However, with this great communication comes a new way of doing things, and mistakes have been made by businesses when communicating via email. 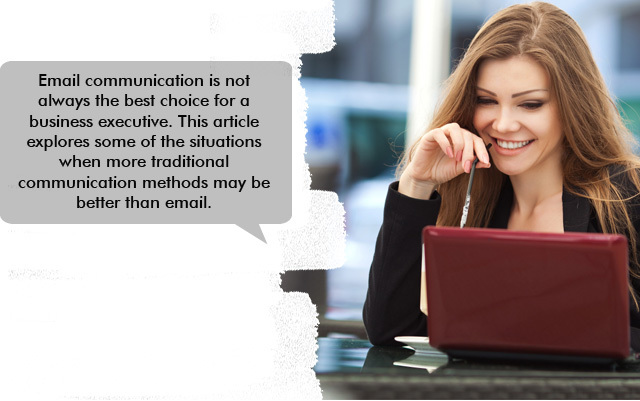 There are certain situations when email is not the best method of communication. Sometimes alternative methods are better. Here is why. Is it beneficial to your job role to spend several hours a day working on something which is essentially a communications tool? Would time be better spent speaking to colleagues, customers or suppliers in person or on the phone? Sometimes it is easy to use email communication simply because it is there. However, it is not necessarily the most efficient form of communication. If too much of your day is taken up reading and writing emails, perhaps look at whether you need to start using alternative forms of communication. There are two ways in which information can easily go astray with email communication. The first is the obvious one: the information can be accidentally sent to the wrong person. Many people have a story to tell when it comes to sending an email to the wrong recipient. Functions such as address books and auto-complete give users the option of speeding up the time taken to write an email address, and it is these same functions that can cause problems. Having two people in your address book with similar names can too often lead to accidents happening: the sensitive internal email is sent to a client, or a joke email is sent to the boss by mistake. The other, more common reason for information going astray is when an email is forwarded on to other people. You have no control over this, other than disciplinary procedures for staff who wrongly distribute emails. Many times, people will forward emails without thinking about the content or they will forward it without looking at the content properly. When information goes astray, this can be troublesome for an individual and also for an organization. Information may be commercially sensitive, it may give the organization a competitive advantage, or it may be related to personnel (for example, salary). The fall out following emails going to the wrong recipients can be significant, and can be time consuming to repair. There is no such thing as a private email communication. The BCC function is effectively allowing you to inform someone of something without other people knowing. This has the potential to turn into a political disaster for an executive. All it takes is for the BCC recipient to forward or reply to an email for your underhand approach to become public knowledge. This can cause huge amounts of damage to your reputation. If a private conversation is needed to inform someone, do it in person behind closed doors. Do you frequently CC the same people to many of your emails? Chances are many of your recipients won’t be reading the information you are sending them. Think carefully about whether someone really needs to read an email you are sending. Sometimes we copy in other people because it is easy to do so, but all we are doing is creating more information overload within an organization. Instead, ask yourself how important that information is to the recipient. Unless it is vital, leave them off the CC list. It takes a skilled writer to produce an email that conveys both a message and the feelings of the writer. It is problems such as this which can cause emails to be misinterpreted. Suitable tone is difficult to achieve in email and it is far too common for recipients to misinterpret an email for example, a request reads as a critique, humor reads as an instruction. There is so much we can convey with our eyes, tone of voice and body language when we speak to people and we cannot get this information across easily in an email. Remember this when writing emails. Sometimes it is a communication method that can cause more harm than good to a relationship with a colleague, client or supplier. So when is email useful? A good rule of thumb about when to use email rather than an alternative form of communication is to ask yourself how easy it would be to communicate that information via a different medium. Typically, sending files as attachments is something easily achieved via email (unless the information is sensitive in nature), and sending emails to large groups of people (large groups who genuinely need to see the information, such as a company announcement), is better achieved via email.